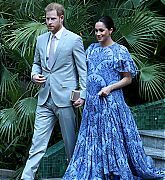 Climbing into a helicopter to fly deep into Morocco’s Atlas Mountains, you would be forgiven for forgetting that Duchess Meghan is over seven months pregnant. 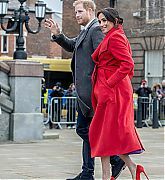 In fact, given how busy recent months have been for the new royal, it would be tough for anyone to object if she wanted to sit out the early-morning expedition—especially after flying in from London less than 48 hours earlier. 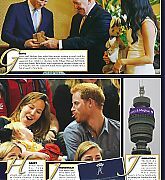 But the February 24 trip was a chance to visit a charity championing a cause close to her heart—universal education opportunities for women—and there was no way she was going to miss it. With Prince Harry’s help, she carefully sat down in the cabin and placed noise-isolating headphones over her head. Ready for takeoff. 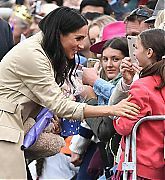 From gender equality and universal education opportunities to social entrepreneurship and female empowerment, the visit’s three-day itinerary shone a spotlight on the issues most important to the duchess. 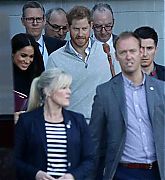 Prince Harry, already established as a humanitarian force of his own, often let Meghan take the lead during their nine Moroccan engagements, leaning in to her ear periodically to see if his wife was feeling “okay” along the way. She always was. HORSING AROUND: Today is the final day of The Duke and Duchess’s three-day visit to Morocco. Their first stop of the day was to the Royal Equestrian Club in Rabat. Their Royal Highnesses saw first hand how equine therapy helps disabled children and young people with mental health challenges. 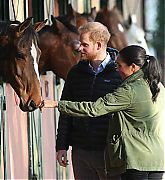 The Duke and Duchess of Sussex met with disabled young people grooming horses at the Royal Equestrian Club and heard how spending time with horses is a source of therapy for them. They also met with staff who work at the Royal Equestrian Club, and mental health representatives involved in the program. 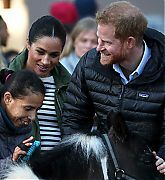 Harry and Meghan also viewed a riding demonstration. 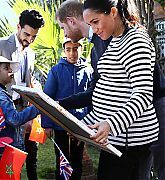 BIG BITE: From there The Duke and Duchess of Sussex took part in a cooking demonstration with children from disadvantaged backgrounds, with Chef Moha, an awarding-winning chef, known for reinventing Moroccan cuisine. 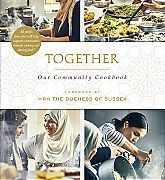 Children made Cherine Mallah’s Moroccan Pancakes from ‘Together: Our Community Cookbook’ – the charity cookbook, supported by The Duchess, which celebrates the power of cooking to bring communities together. 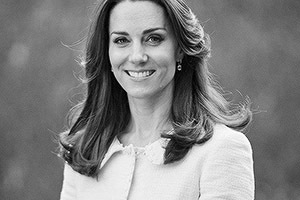 The Duchess later went on to swap cookbooks with Chef Moha, leaving a personal message to him saying: “Chef Moha. Wishing you continued success and congratulating you on your incredible work in engaging the community in cooking. All the best. 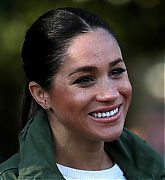 Meghan”. 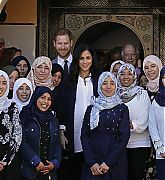 MOROCCAN CULTURE: In the last public engagement of the day Harry and Meghan visited Rabat’s Andalusian Gardens to meet some of Morocco’s young social entrepreneurs. Many of these young people here are working to address youth unemployment and supporting vulnerable communities. 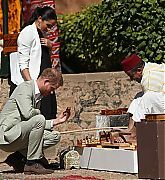 Their Royal Highnesses got the chance to see more of Moroccan’s vibrant culture, meeting local artisans in the Andalusian Gardens who showed and gifted The Duke and Duchess some of their creations. 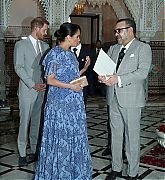 FAREWELL: To conclude the tour The Duke and Duchess of Sussex attended an audience with Mohammed VI of Morocco, The King of Morocco at a Royal Residence. 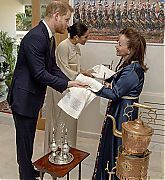 While there Their Royal Highnesses presented letters from Her Majesty The Queen to The King and bid farewell to Mohammed VI of Morocco, his son The Crown Prince of Morocco, Prince Moulay Hassan, and The King of Morocco’s sisters, Princess Lalla Hasna and Princess Lalla Meryem. EDUCATION FOR ALL: On day two of Their Royal Highness’ tour of Morocco, education took center stage. 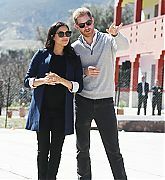 The Duke and Duchess traveled by helicopter to the Atlas mountains to visit Asni and the ‘Education for All’ boarding houses there. The boarding houses run by a Moroccan NGO, provide access to secondary school learning for girls between the ages of 12 and 18 who live in rural areas live nearer to their school so they can continue their education. Upon The Duke and Duchess’s arrival the girl’s greeted them with a welcome song. Inside the classroom, Harry and Meghan talked with girls studying for exams, and chatted about what courses they would like to take in university, and what careers they would like to pursue. 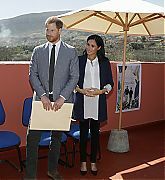 In their second visit The Duke and Duchess visited Lycée Collegial Le Grand Atlas, a school next to the ‘Education for All’ boarding houses where students were practicing their English. 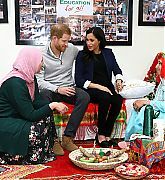 During this visit a Henna ceremony was performed on The Duchess of Sussex, which is a Moroccan tradition for pregnant women and the couple spoke with teachers from the Lycée Collegial Le Grand Atlas, and then enjoyed watching a football match after classes, meeting with the players. Later in the afternoon, The Duke of Sussex presented Founder of ‘Education for All’, Michael McHugo, with an MBE in the New Year’s Honours List 2019 for services to improving gender quality in education in Morocco. The presentation happened on the roof of the original ‘Education for All’ boarding house. After the ceremony, The Duke and Duchess met with some of the girls’ who have lived in the ‘Education for All’ boarding houses, and well as tose who have helped make ‘Education for All’ a success, including housemothers, who look after around 40 girls in each boarding house throughout the week. 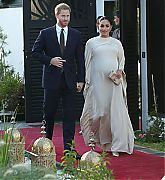 EVENING RECEPTION: For their final engagement of the day The Duke and Duchess of Sussex attended a reception at the official residence of the British Ambassador, Thomas Reilly in Rabat. 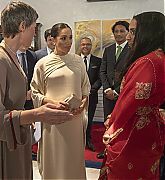 Greeted by Reilly;s daughters and welcomed with a traditional rose-water ceremony they met young entrepreneurs, influential women in Moroccan society, military representatives and disabled athletes. OFFICIAL WELCOME: It’s officially the start of The Duke and Duchess’s brief three-day tour of Morocco! The tour will focus heavily on girl’s education and empowerment as well as supporting children from disadvantaged backgrounds. The couple arrived an hour late to Casablanca Airport due to a flight delay with a small entourage. They were officially welcomed by the British Ambassador to Morocco Thomas Reilly, his wife, and other officials. 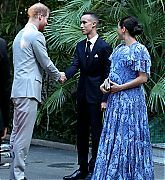 Prince Harry then went on to inspect a Guard of Honour and the couple were then greeted by 15 year old Crown Prince Moulay Hassan at the Royal Residence. 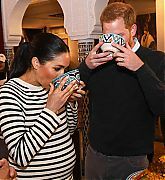 Kensington Palace announced this morning that Harry and Meghan will undertake a three day visit to Morocco, North Africa later this month. 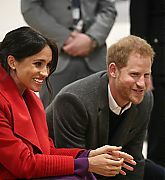 The Duke and Duchess of Sussex will visit Morocco from Saturday 23rd February to Monday 25th February 2019. This visit is at the request of Her Majesty's Government. 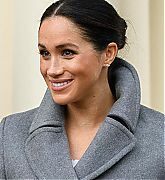 Today, (January 30, 2019) The Duchess of Sussex made her first visit to the National Theatre as Patron. Her Majesty The Queen passed on the Patronage to Meghan having held the role for the past 45 years, earlier this year. During this visit Meghan took the opportunity to learn about the National Theatre’s work with arts and community organisations across the UK. As well as meet with current and former Nation Theatre apprentices. She also enjoyed a performance inspired by War Horse by schoolchildren from Edith Neville Primary School in Camden, which was created to mark the centenary of Armistice Day and watched a line run from Shakespeare’s Pericles — the NT’s first Public Arts production of Pericles was performed by a company of over 200 people of all ages recruited through the National Theatre’s partners. 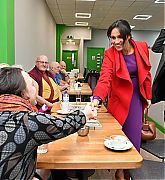 Today, (January 14, 2018) The Duke and Duchess of Sussex traveled to Birkenhead for a day of engagements. 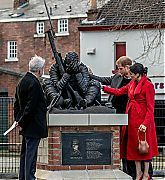 The royal couple started off their day at Hamilton Square where they viewed a new sculpture erected in November to mark the 100th anniversary of Wilfred Owen’s death. The statue, named after one of the war poet’s poems ‘Futility’, is cast in bronze and represents an exhausted WW1 soldier. 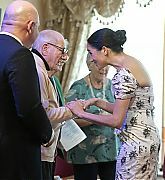 Harry and Meghan met local veterans and members of the Birkenhead Institute Old Boys, of which Wilfred Owen belonged to, and which played a part in the creation of the tribute. 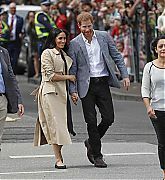 The couple then greeted the large crowds of waiting admirers. 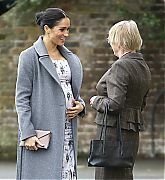 During the walkabout Meghan revealed that she is six months pregnant, but revealed later that she and Harry don’t know if the baby is a boy or girl. In the couple’s second unannounced engagement they officially opened Number 7, a ‘Feeding Birkenhead’ citizens supermarket and community cafe, at Princess Pavements, Pyramids Shopping Centre,the new store enables local families to buy their weekly shopping at a discounted price, and provides advice and advocacy on benefits, looking for work, debt, budgeting, and cooking. They also revealed plans to launch a “baby basics” program which will provide baby clothes and toiletries to new moms. 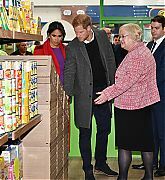 The couple toured the new supermarket and enjoyed coffee and tea with the locals. The Duke and Duchess then visited Tomorrows Women, an organization that supports women in vulnerable circumstances. They offer an extensive range of training courses and workshops for more than 6000 women as well as support groups focusing on mental health issues, domestic abuse, and addiction. 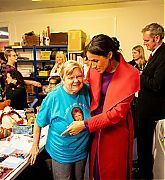 Harry and Meghan met women taking part in a knitting and flower arranging sessions. Their last stop of the day was at The Hive, a safe environment for young people to enjoy themselves, building key skills and raising their aspirations and confidence. 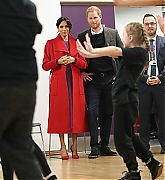 Harry and Meghan enjoyed a performance upon their arrival by the Junior Dance Troupe and took part in a number of activities and workshops throughout the centre. 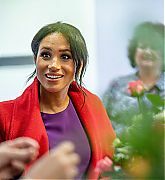 Today, (December 18, 2018) The Duchess of Sussex visited Brinsworth House, a residential and nursing retirement home for theatre and entertainment professionals in Staines Road, Twickenham, west London, England. 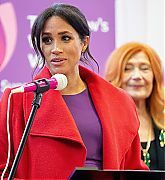 The Duchess expressed the desire to visit the home after seeing footage of it at the end of this years’s Royal Variety Performance which she attended back in November with Prince Harry. 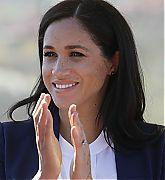 Emily Nash reported that Meghan revealed she use to visit something similar when she lived in L.A. During her visit The Duchess received a tour of the facilities and met with staff before joining residents in a few Christmas themed activities including an arts and crafts session with which she added her own contribution to their Christmas artwork and viewed a musical performance. Before her departure Meghan signed the guest book and unveiled a plaque marking her visit. Last night, (December 10, 2018) The Duchess of Sussex made a surprise appearance to The Fashion Awards where she presented the British Designer of the Year – Womenswear to Clare Waight Keller who designed her wedding dress and other already memorable pieces for Meghan this year. 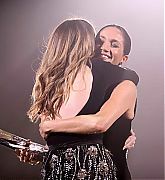 The award recognised Clare Waight Keller’s formidable contribution as a British fashion designer to the industry, and was decided by a panel of over 2,000 international industry experts. In many ways, it seemed like Meghan Markle was entering an impossible situation when she married Prince Harry in May. 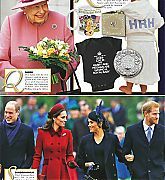 No matter what she did, she would be seen as an American outsider in the British press, her every move scrutinized to an absurd degree, her every outfit or gesture compared immediately to either that of her new sister-in-law, Kate Middleton, or to any number of the royal women who had come before her. 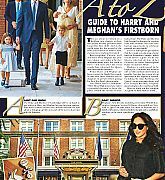 And in her first few months of her Duchess of Sussex-dom, though they went fairly smoothly, Meghan was accused multiple times of “breaking protocol” or committing some nearly invisible “faux pas.” She closed a door on her own! She isn’t wearing a hat when she should be wearing a hat! She shows P.D.A. with Harry!!!!!! The Duke and Duchess of Sussex have been given a “long list” of potential baby names suggested by friends and family. 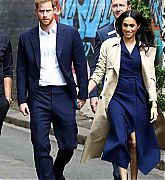 The royal couple, who are expecting their first child in the spring, told curious children in Australia they are “going to sit down and have a look at” the options. 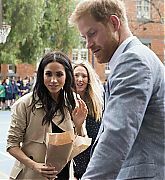 During a trip on the Melbourne tram, the Duke and Duchess were interrogated by schoolchildren who spent the journey of just a few minutes asking them about their plans for parenthood. 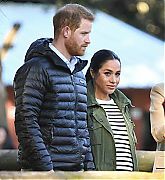 Charlie Wolf, a 12-year-old pupil from Middle Park primary school, asked if the couple had any names for their unborn baby. And it’s back to Sydney for Day 4 Royal Visit Australia! 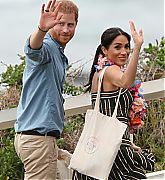 BONDI BEACH: Their Royal Highnesses visited Bondi Beach, one of Australia’s most famous landmarks. The Duke and Duchess met with a local surfing community group, known as OneWave, raising awareness for mental health and wellbeing in a fun and engaging way. 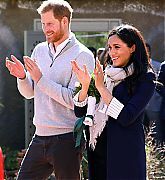 Their Royal Highnesses took part in the “Fluro Friday” session, where people of all ages share their experiences of mental health issues, they also had the opportunity to interact with others enjoying yoga and surfing. Before departing, The Duke and Duchess had met with many excited members of the public gathered on the beach. INVICTUS ARRIVAL: Prime Minister the Honourable Scott Morrison MP, and Invictus Games competitors with The Duke climbed the Sydney Harbour Bridge to officially raise the Invictus Flag, marking the arrival of the Invictus Games to Sydney. 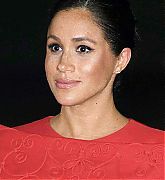 Meghan later joined Harry with calls on the Leader of the Opposition at Admiralty House, and the Prime Minister at Kirribilli House. After banana bread and rain storms, Day 3 of Royal Visit Australia kicks off in Melbourne! 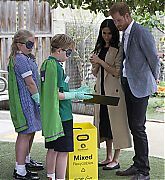 The third day of The Duke and Duchess’s visit to Australia was a busy one with six scheduled engagements and a few embargoed stops along the way. 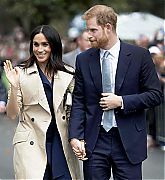 OFFICIAL RECEPTION: Their Royal Highnesses will fly to Melbourne where the day will begin with a short walk to Government House, meeting members of the public along the way, before attending an official Reception at Government House. A diverse group of young Victorian leaders and community members will attend the Reception, including Queen’s Young Leader Hunter Johnson from The Man Cave. A demonstration of various sporting activities will take place in the grounds, with ambassadors from the This Girl Can campaign. 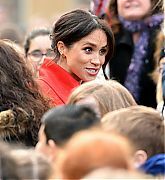 Meghan was even persuaded to toss a rugby ball during the demonstrations. 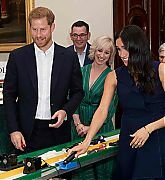 Once inside Harry and Meghan raced a scaled, miniature Formula 1 car designed and made by Trinity Grammar students. A hysterical moment ensued when the cars were launched, watch the video before to see Meghan get a surprise! 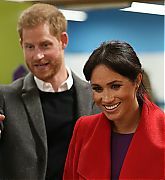 ENTERPRISE CAFE: The Duke and Duchess visited Charcoal Lane, a social enterprise café which offers leadership, mentoring and training programmes for young Aboriginal people. Upon arrival the pair were shown a mural outside the building created by artist Robert Young, of Gunnai and Waradgerie heritage. 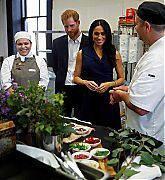 Inside, Meghan was totally comfortable in the kitchen chatting with the head chef, Greg Hampton as he offered a crash course in indigenous Australian ingredients with a “touch, taste and smell” session. 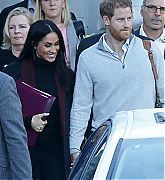 Afterwards, Harry and Meghan had lunch at the cafe. 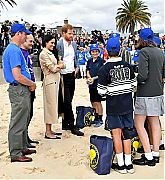 SOUTH MELBOURNE BEACH: Upon departure from the school, The Duke and Duchess headed to South Melbourne beach, where they met volunteers from a local beach patrol programme. 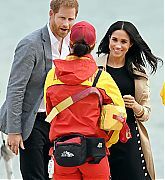 Here Their Royal Highnesses learned about efforts to keep Port Phillip Bay beaches and foreshores clear of litter to reduce the negative impact on the marine environment. It’s Sunday night here in the states as well as other places in the world, but it’s early Monday morning in Sydney, Australia. 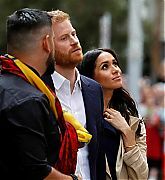 The Duke and Duchess of Sussex touched down at Sydney Airport around 7 am (Sydney, Australia time) on a commercial Qantas flight. The duo were whisked away quickly and driven to Admiralty House where they will be staying while in Sydney. The couple will be spending the day relaxing and prepping for the busy days ahead. 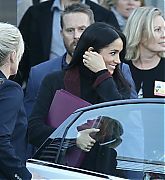 Meghan seems to be hard at work preparing for all of the upcoming meetings and engagements, as you can see from the purple binders she’s holding. Official engagements won’t start until October 16 (Sydney, Australia time). You can check out tomorrow’s schedule below. I have added 4 high quality photos to the gallery. More will be added at a later time. Enjoy! 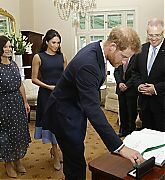 Official Welcoming – The Duke and Duchess of Sussex will begin the tour with an official welcoming reception at Admiralty House, the official Sydney residence of the Governor-General of Australia, His Excellency General the Honourable Sir Peter Cosgrove and Lady Cosgrove. Representatives from each of the eighteen countries who are participating in the Invictus Games Sydney 2018 will be present. 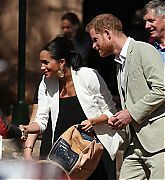 Taronga Zoo – The Duke and Duchess will then travel to Taronga Zoo to officially open the new Taronga Institute of Science and Learning. 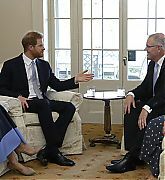 The visit will also be attended by the New South Wales (NSW) Premier, The Duke and Duchess will meet two koalas and their joeys that are part of the Zoo’s breeding programme, and visit the laboratory to meet female conservation scientists who are working on efforts to reduce illegal wildlife trafficking. Sydney Opera House – To depart the Zoo, The Duke and Duchess will travel by vessel across Sydney Harbour to the Sydney Opera House. 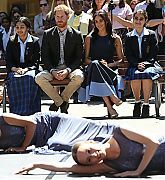 Once inside, Their Royal Highnesses will view a rehearsal of Spirit 2018 by the Bangarra Dance Theatre, an internationally acclaimed Aboriginal and Torres Strait Islander modern dance company. Upon departure, walking along the Opera House forecourt, The Duke and Duchess will have an opportunity to meet members of the public. Evening Reception – The first day of the visit will conclude with a Reception hosted by the Governor-General at Admiralty House, to be attended by Australians from a broad range of sectors including charity and community, business and industry, arts and culture, sport and entertainment. Today, September 25, 2018, The Duchess of Sussex went on her first solo engagement since becoming the newest member of the Royal Family when she opened the new exhibition ‘Oceania’ at The Royal Academy Of Arts. 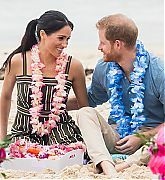 The ‘Oceania’ exhibition features art from New Zealand, Fiji, the Kingdom of Tonga, and Australia – all countries Harry and Meghan will visit in October. During her visit she spoke to some of the artists as well as descendants linked to the works on display.